There are some manicures that you should never ever get, and we all know those fails because we’ve seen them on someone. But have you ever crossed the line and became one of those people? Women nowadays have different definitions of what is beautiful and what is not. We are not saying that you are doing something wrong, but pretty much you should try to avoid some types of nail manicures. Have you seen those too thick and over done nails on a certain someone? Well, that might be the right manicure to avoid. No one likes to be in the center of the spotlight for something negative. The right way to style your nails should be something fun and feminine. Nothing too tacky or too dramatic. The following 7 manicures should be on your “MUST DEFINITELY AVOID” list. You know when sometimes much is too much, and you really have no idea what you are doing? This ”Geez Louise” manicure really looks like a Halloween prank! Halloween seems like the only time of the year when it would make sense to wear something like this. In any other occasions, please no. These nails are super tacky and not feminine at all. Were you terrible back in the middle school at drawing as well as painting? Arts and crafts aren’t your cups of tea? Well, then maybe you should stay away from painting your nails on your own. Women often have problems with this type of stuff, especially when it comes to the usage of their left hand and a nail polish. It might be the best for you to go to the salon if you are feeling shaky, that way you will avoid this manicure fail. We all love a good set of acrylics and a good set of a french manicure. But these? You should always have precisely shaped, glued down and filled nails. Whoever ended up with this manicure fail definitely deserves a refund as well as an apology! Women, remember, rather go to a top rated and pricey nail salon instead of some cheap one. That way is the only way you can save yourself from misery. This challenge has been anywhere and everywhere, and you must have heard about it before. The picture says more than 1000 words, and it is quite obvious why this one is a fail. Just avoid the mountain polish charade and you’ll be fine. This manicure should be avoided at any causes! If you know any nail technician who can do it this poorly just delete them from your life. Seriously, delete and block their number. There is no reason for your tips or acrylics to be this thick. You will look like a duckling and an ugly one. Avoid long nails, even tho you might love them. This manicure fail is a no go since these nails look so hard to work with. They are unpractical, look nasty and anti hygienic, and even the color is distracting us. Never let your nail technician do them this long, or even worse never grow them this long yourself. 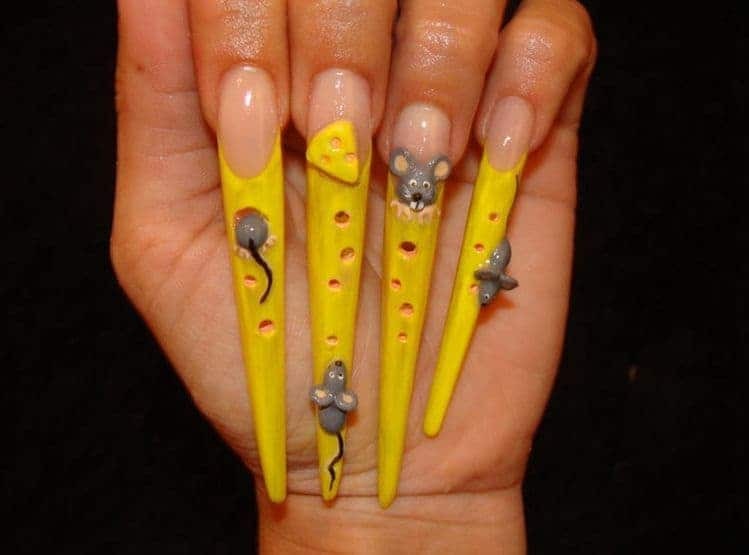 That is an ultimate manicure that you should avoid! Too long toenails look ugly and super unpractical. Is there a way for you to tie down your shoes, or even to put your feet in there? And it is not just that it is not a pretty sight, this type of a ”manicure”can easily lead to infections. Several fungus and yeast infections could occur, so there is no reason for you to let your toenails grow more than a millimeter or two above your skin. We all have our glory days and some fails, which is totally normal. But don’t let your nails make you a star of the show- a horror show! The top 7 manicures are a big fail and you should avoid them at any cause.